Broadcast-networks targeted by Siemens were those of stock markets, financial markets, international shipping departure & arrival information, and police (e.g., "wanted" warrants). Command/control networks were those of railway systems, fire departments, electrical power nets. Ref. 1. Starting 1955/56, the Deutsche Bahn (DB, German national railway system) began to replace their 6000 Morse-telegraphy stations with 1300 Hellschreibers model T.typ.72 "GL", T.typ.73 "AGL", and printer-only model T.empf.39 "L". 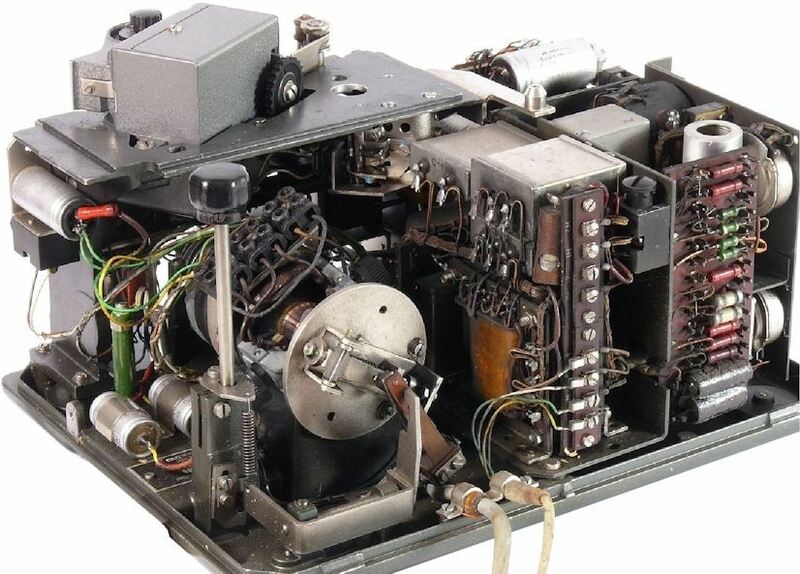 This allowed DB to reduce the workforce of their teleprinter service ("Fernschreibdienst") by 400, and save 80 thousand Morse-code training days per year - combined about 1 million Deutsche Mark (DM) per year (ref. 2, 3). Based on the development of the German consumer price index since 1955, this is equivalent to an estimated 2.16 million Euros in 2012 (ref. 4, 5). Note that teleprinter equipment prices do not necessarily follow the general cost of living inflation. In 1954, DB paid 1000 DM for Hellschreiber printers (ref. 6A) - about 2600 Euros (2012). 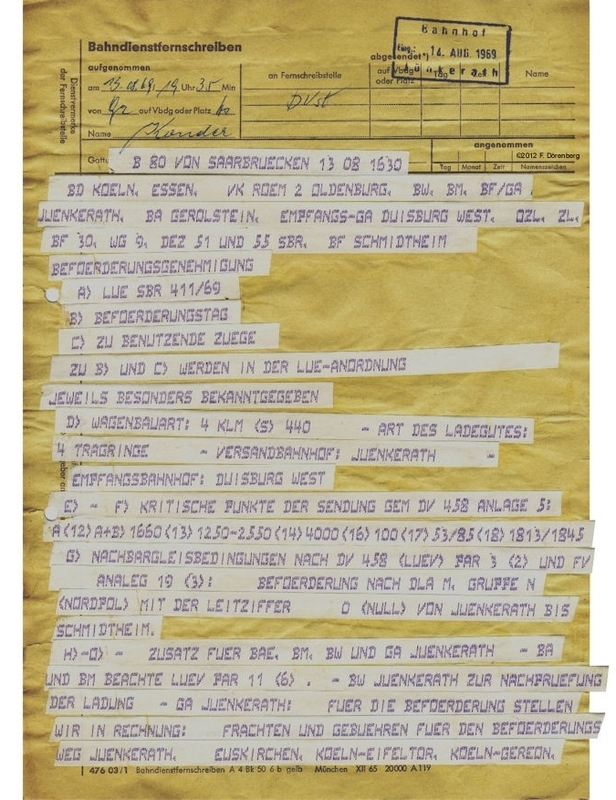 Regular "telex" sheet -teleprinters were much more expensive, and only used at head-offices ("Direktionssitze", "Ämtersitze") and a few major railway stations (ref. 6B). 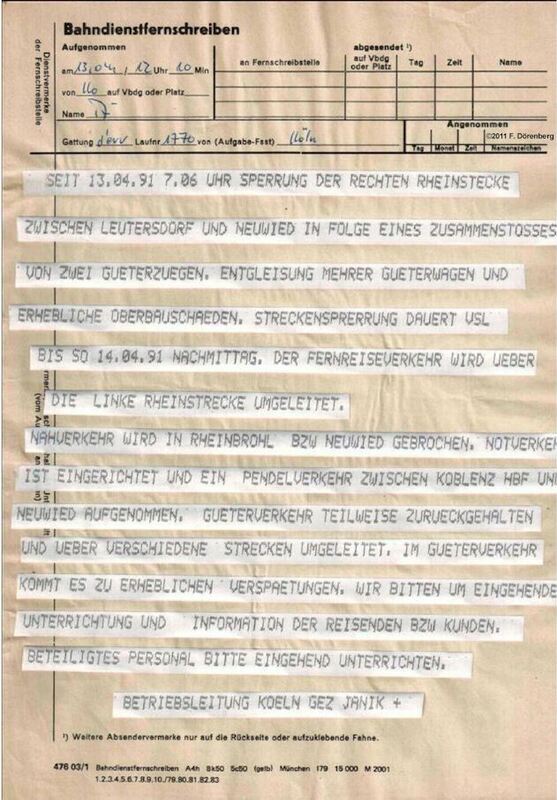 In 1967, DB consumed about 60000 rolls of Hellschreiber paper tape (ref. 6C). 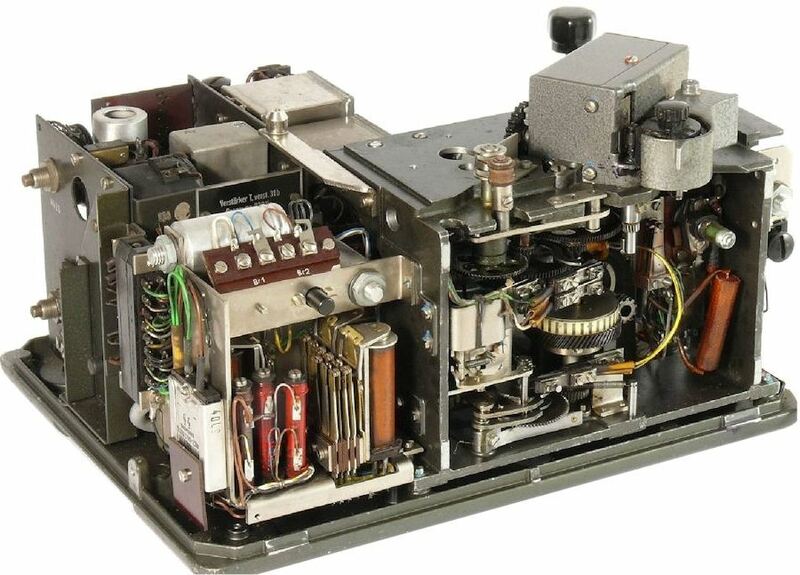 In 1968, DB owned 1440 Hellschreiber machines (ref. 6D). Hellschreiber communication was done via the existing private, automated telephone network of the DB: the Bahnselbstanschluß-Netz. The BASA-Netz was in established in the mid-1930s by the Reichsbahn, the predecessor of the DB. It connected all railway stations, controls posts, and offices. Over the decades this network grew to some 120 thousand phone and teleprinter terminals. The DB used Hellschreibers throughout the 1980s (ref. 6E). These machines were used by the German railroad system in the Neanderthal region (i.e., near Düsseldorf) until ca. 1995 (ref. 7). The last DB service regulations that mention Hellschreiber are from 1983 (ref. 8). The photos below are of model T.empf.39b and T.empf.39d. I presume there were also model 39a and 39c. I do not have any information about the differences between these model variants. The machine looks similar to models 40a "F" and 44c/e - but the 39 "L" has an indicator light on the front, with a square lens. Start-stop synchronization: start-pulse in the first column of the Hell-font. Input bandpass filter: center frequency selectable 1000 Hz / 3000 Hz. 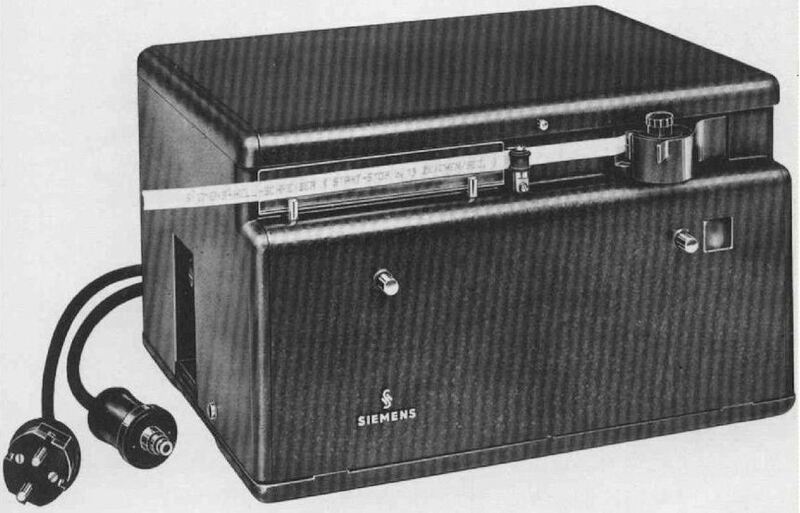 Paper tape width: 9.5 mm (as only a single line of text is printed, the paper tape can be narrower than the 15 mm paper tape of the Feld-Hell, Presse-Hell, and model T.empf.40 "F". Motor: 2100 rpm brushless AC type with centrifugal regulator. 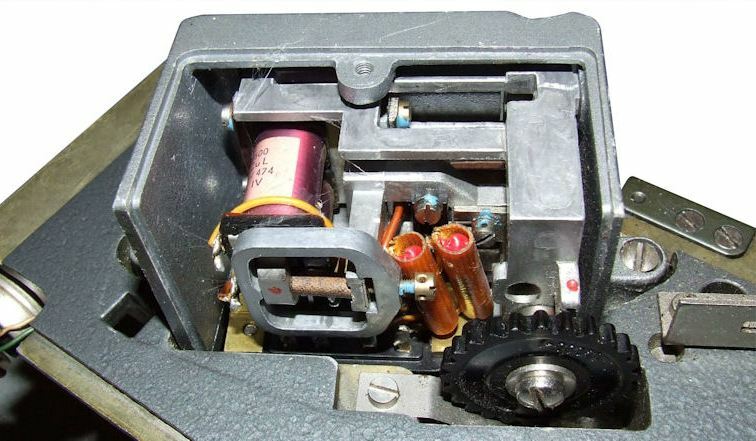 The speed control knob is located under the lid of the unit, next to the roll of paper tape. The start-stop synchronization accommodates up to 2% speed difference between sender and receiver/printer. The speed can be checked visually with a strobe disk on the motor shaft, and a 125 Hz tuning fork ("Stimmgabel", ref. 9). Remote control: tone pulse of 180 msec (minimum) to 1 sec (nominal) to turn the motor on, and 4 sec (minimum) to 6 sec (nominal) to turn the motor off. ("off"). This is the same as in the Presse-Hell printers. Control-tone frequency could be 25, 1000, or 3000 Hz, or DC. 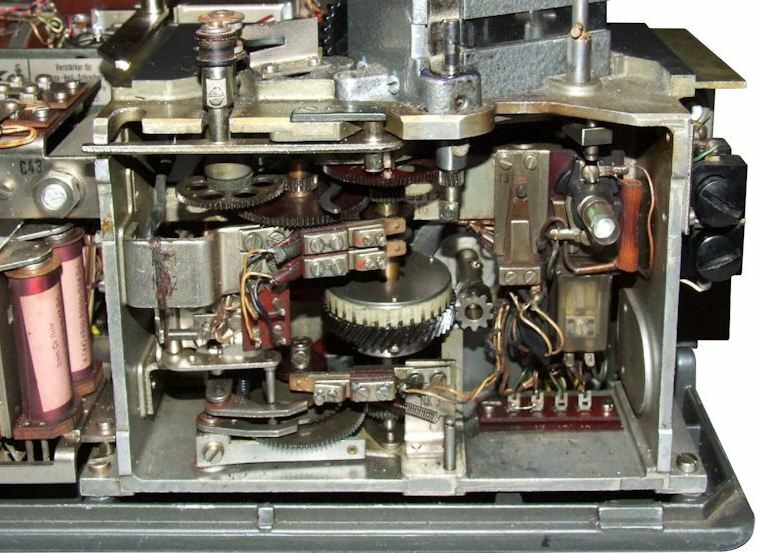 Figure 6: Inside of the printer-module of a T.empf.39 "L"
Figure 7: Gearing of a T.empf.39d "L"
The following Hellschreiber telegram (note: from 1991 !!!) is a "Bahndienstfernschreiben", i.e., a telegram of the national German railway company ("Deutsche Bundesbahn"). It was printed with a T typ 72, T typ 73, or a "printer-only" T empf 39 (cf. Bild 3 in ref. 12). 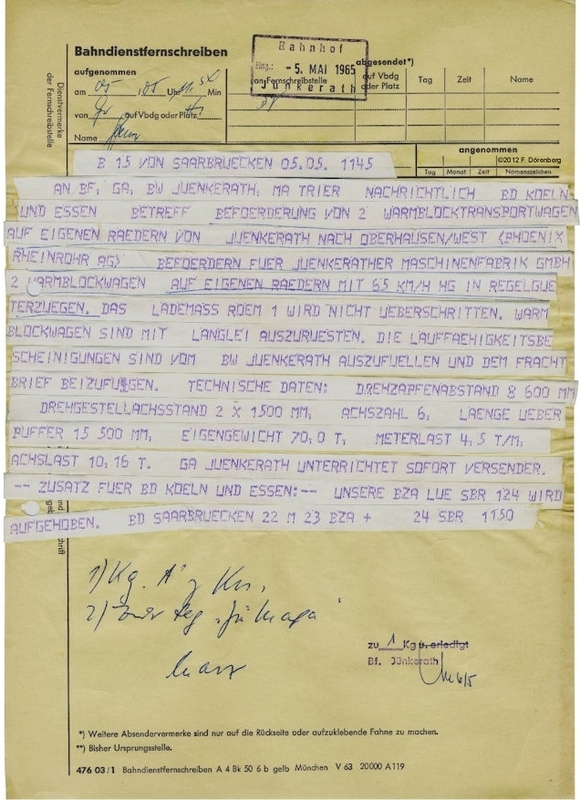 Several examples of telegrams printed with a 1935-45 Hell Feldfernschreiber are on this page. Ref. 6: "Signal + Draht: Zeitschrift für das Signal- und Fernmeldewesen der Eisenbahnen"
Ref. 7: "Wann wurde eigentlich der letzte Hellschreiber außer Betrieb genommen??" ["When was the last Hellschreiber taken out of service?? "], 2008 thread in the "Historische Bahn" forum of "Drehscheibe" ("Turntable") website of railroad enthousiasts. Ref. 8: "Vorläufige ergänzende Bestimmungen zur Fernschreibvorschrift (für den Wählbetrieb, den Betrieb von Hellschreibern und das fernmündliche Zustellen und Aufgeben von Fernschreiben)", Deutsche Bahn, Dienstvorschrift 476 b, 1 February 1953 (addendum to DV 476); reprinted 1983.